The best weather was announced. Hot it should be. Which meant to get up early so I could escape both, the greatest heat and the expected masses of hikers on the mountain, during my the ascent to the summit. Also plenty of water (2x 1,5l + 1x 0,75l) had to be packed and carried along, because on this tour there are no huts where I could have provided myself with liquids, if necessary. Already at 7:40 am I arrived at the parking lot Ettalsattel (€3/day payable at an ATM – so don’t forget to take change along! – including a mobile restroom). Approximately 25-30 cars can park there and the parking lot was almost half full already. After finishing packing my backpack and storing away my fleece jacket which I already didn’t need anymore, I started off at almost 8 am sharp. A few steps after leaving the parking lot I got to a gravel road/track which I followed to the left for about 3/8 of a mile. There in a sharp right turn, I turn even sharper right and follow the steep path up into the forest. Through the dense mountain forest the steep path leads for about one hour constantly steep uphill. 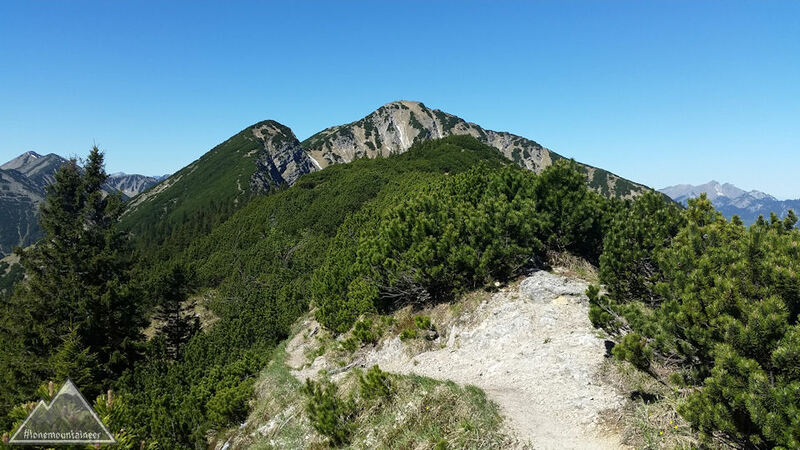 Shortly before the first milestone, the Ochsensitz (4970 ft.), I reach a larger clearing. as well as a great panoramic view of the surrounding mountains. 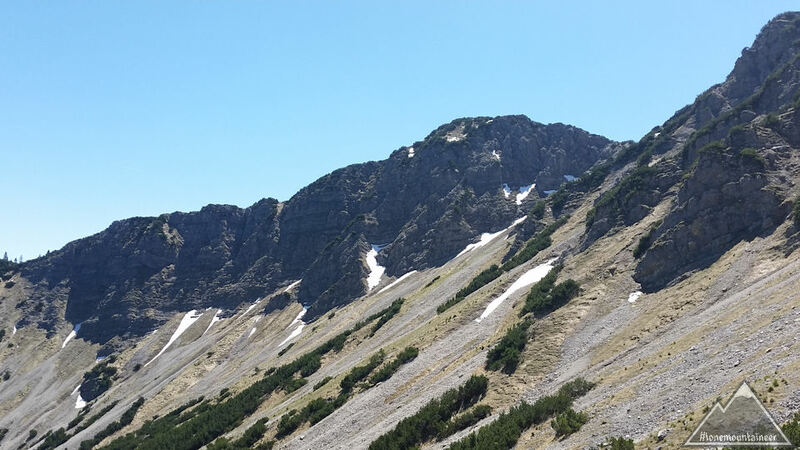 From the Ochsensitz I continued to the about 700 ft higher Ziegelspitz (5640 ft.). 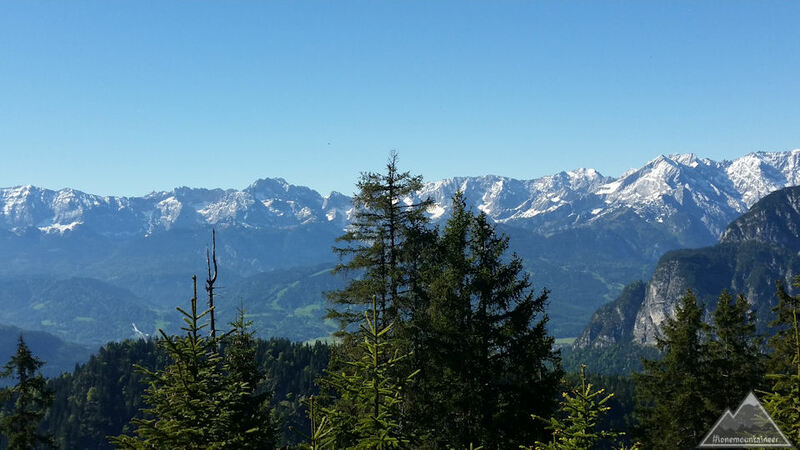 On the way I took a first rest with best view of Garmisch-Partenkirchen and the Wetterstein mountains with the Zugspitze. Beginning with the last ascend to the Ziegelspitz you only walk between low-growing slips, so that I didn’t have any protection by trees from the sun anymore, but on the other side I could almost undisturbed enjoy the fantastic panorama (towards south the Wetterstein mountains and towards north and west the Ammergauer Alps). 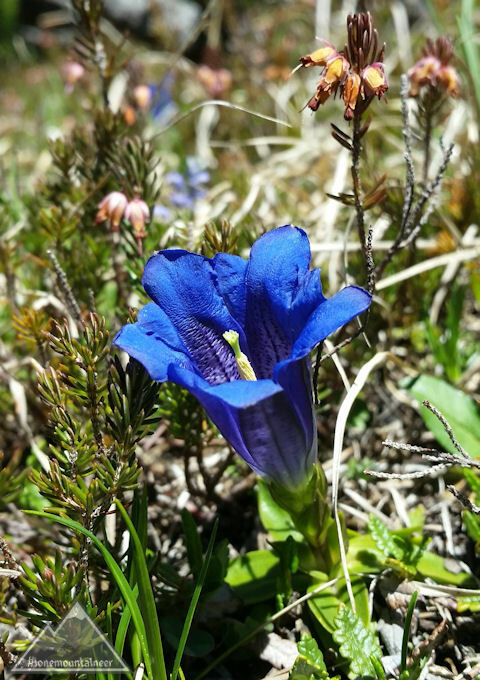 Shortly after leaving the Ziegelspitz I came across my first gentian of the year. At about 11:35 am I arrived on the Notkarspitze. 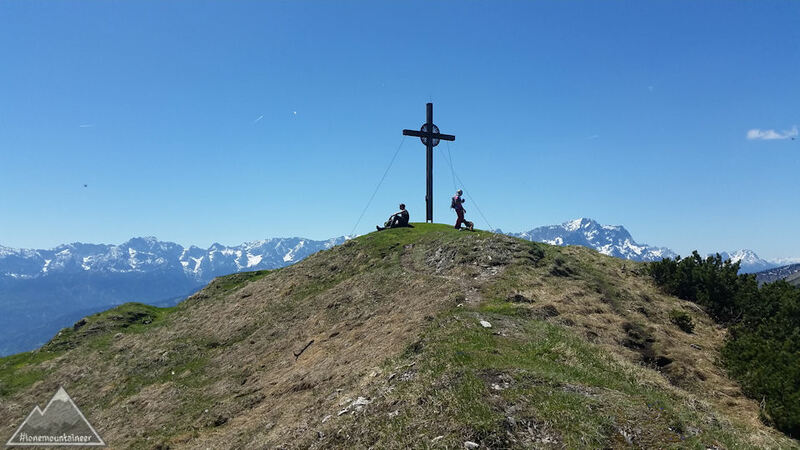 A few hikers rested already on the broad grassy summit, so that you never got the feeling of the summit being full – opposite to beginning of April on the Brecherspitz. After extensive fotografing in all directions, I decided for another rest, before I would start my descend which has been described as difficult and at spots even dangerous. Offering nice views on the barren, rugged north side of the ridge, it the path lead actually quite steep downhill. The path was covered with fairly loose, coarse gravel, which again and again meant that the seemingly safe stand was not quite as safe as I thought, so that despite all the caution I occasionally slipped a bit. Which led to the fact that I was only progressing slowly, as at almost every step I had to make sure my stand was safe and I could only make small steps because of the steepness. 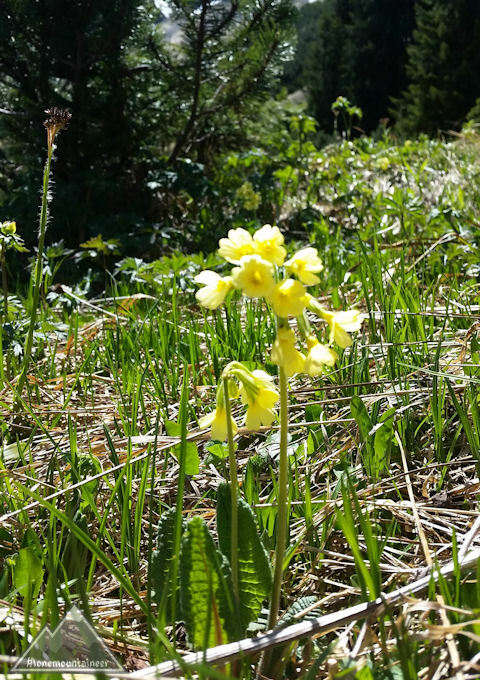 Just before I came into the – initially sparse – mountain forest, I went past a large, beautiful cowslip meadow. But also in the forest it was very steep with sometimes almost vertical slopes right next to the trail. Here I finally came to the dangerous, rope-secured passages, which you wouldn’t perceive as difficult or even dangerous when going uphill, but on the descent, and especially with about 5 hours of hiking in the legs, I was nevertheless very grateful for the rope safeguards. And on it went downhill. Just, whenever I had an unobstructed view into the valley, it always seemed to me as if I had not made any progress towards the valley at all. Only the slowly increasing louder motorbike noise, which sounded up the mountain, made me believe that I would still somehow get down in the valley. 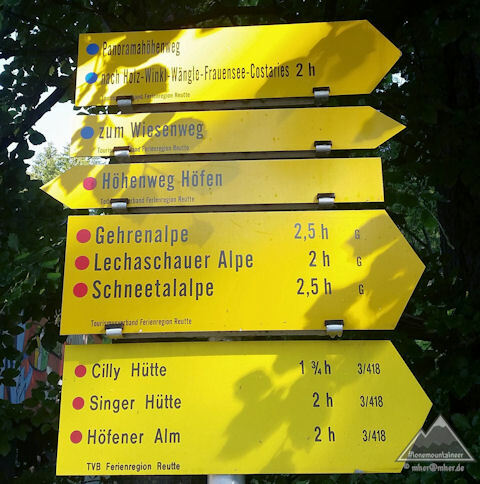 When I finally arrived in the valley, I still had to – in the meantime thursty and without any more drinking water – return alongside the forest and past Ettal back to the parking lot at the Ettaler Sattel (ca. 2 miles). At around 2:45 pm I arrived happily at my car. 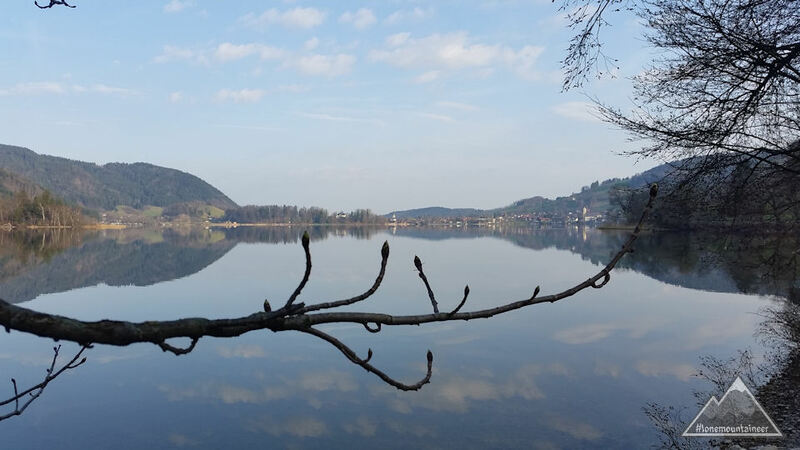 After my first tour this year in early April (Brecherspitz-Tour) I had to take some time off due to health-reasons. Then, last week, I had to pass again, this time due to the snowfalls the days before, which lead to so much snow in the mountains, that I’d decided to wait another week before going into the mountains again. But now I had to go again: For the beginning of the season I planned some shorter tours and so I wanted to go from the Spitzinglake to the Bodenschneid summit. 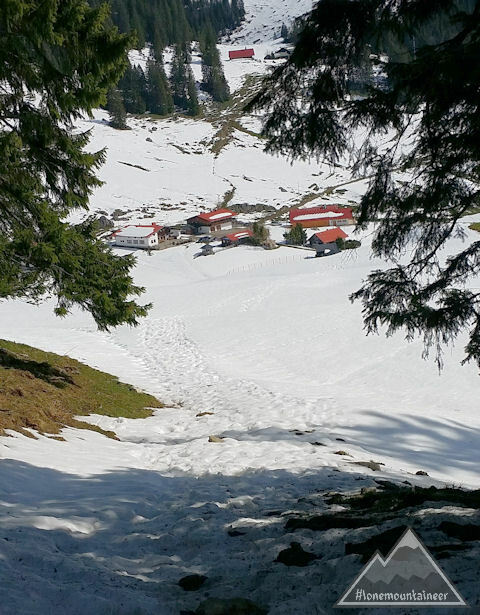 During the last days I tried to evaluate the snow situation in the mountains via webcam. From what I could see I thought it’s at least worth a try. According to the weather report it would be best to go right early saturday morning. So I set my alarm clock, that I could leave home already at 7 in the morning. At home everything was covered up in fog, and I hoped that the weather report was right and the sun would come out soon. And so it was: after only 15 minutes on my way I was already driving in beautiful sunshine. This time I didn’t park up at the Spitzingsaddle, but went on a little farther. Immediatly up at the saddle a rather small road, the Stümpflingweg, forks off to the right. This leads to a pretty large parking lot (free of charge btw.). The parking lot was almost empty, which let me hope, that I wouldn’t have to expect too many “Co-Hikers”. On the other side I started doubting that I decided right, as the two men from the car next to mine, were getting ready for a skitour. Did I judge the snowsituation that poorly? Well, never mind, since I was already there, I could just as well check it out how far I could go. Packing my backpack, I put my heavy hiking boots for starters into the backpack and wore the lighter trekking-shoes, as the first part of the track would be an asphalt road up to the Untere Firstalm (lower firstalm). Quickly I took a picture of the Firstgraben, the creek running alongside the parkinglot, which had, due to the melting of the snow plenty of water. The two skitourers took another direction, so that I hoped, that my way wouldn’t be that full of snow. The Kratzerweg to the Untere Firstalm was completely free of snow. 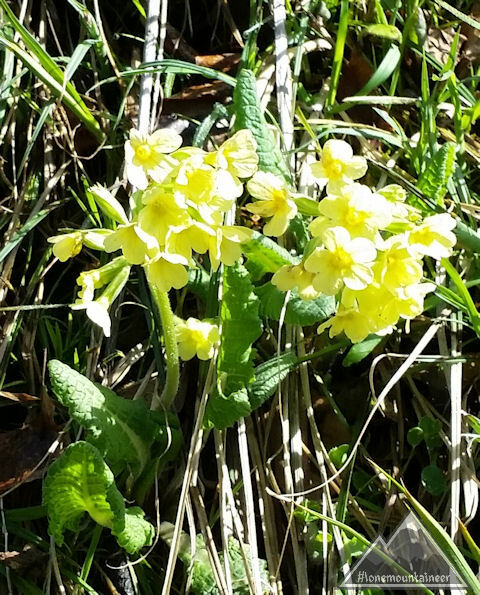 Left and right to the way a lot of cowslips. But you could see, that the snow of the last week didn’t do them any good. Half way up the asphalt road turned into a gravel road, but still free of snow. Despite a few fotostops I reached the Untere Firstalm already after about 30 minutes (the sign at the parking lot indicated 45 minutes). From here two different tracks lead to the Bodenschneid. 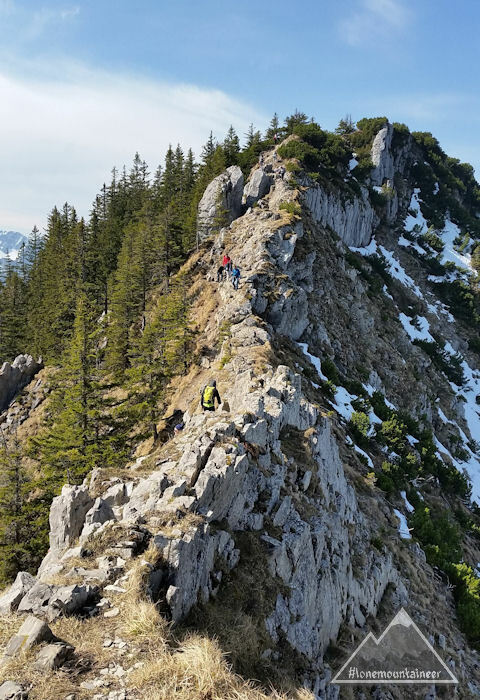 My plan was to go via the Suttenstein up to the Bodenschneid summit and then return via Bodenschneidhaus, Freudenreichalm and Obere Firstalm (upper Firstalm). 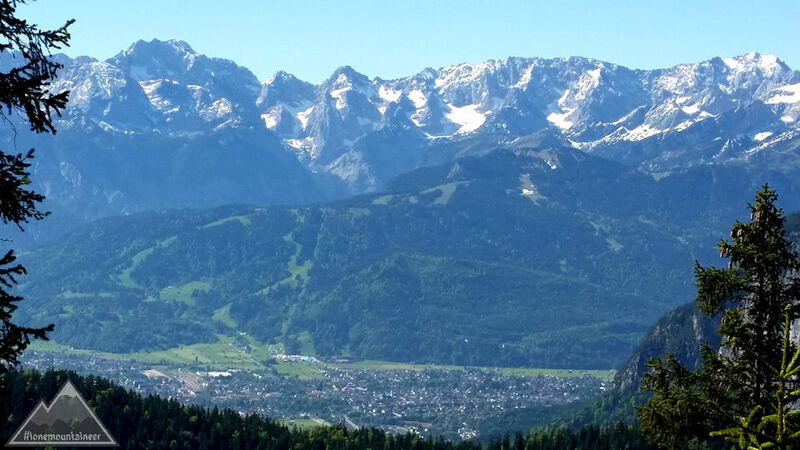 As I had to cross a rather large snowfield all the way up to the Suttenstein, I changed shoes. Due to quite some tracks in the snow I could easyly recognize where to go. In the beginning the snow was only ankle-deep and sometimes the snow even held my weight so that I bare sank in at all. But the farther I got, the more often the snow gave in and I sank sometimes kneedeep into the snow. 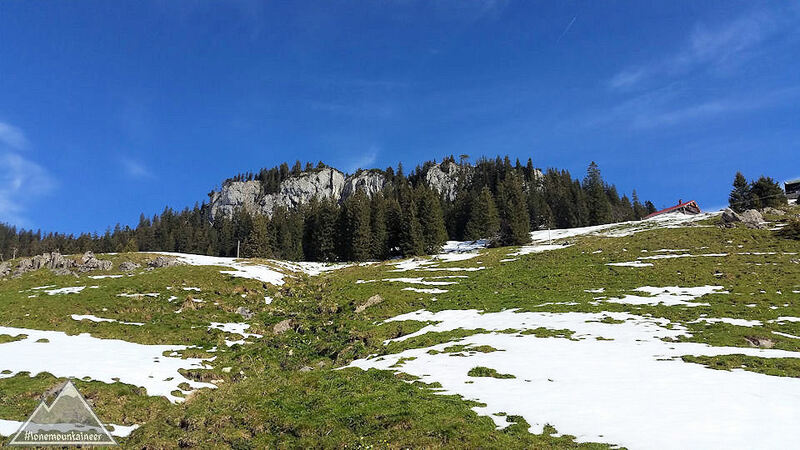 But since the track from the Suttenstein up looked free of snow I fought my way further through the snow. 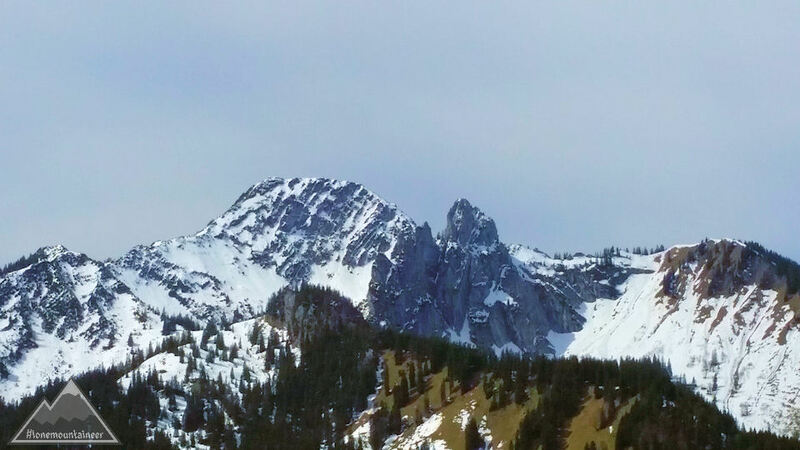 After about 30 minutes I reached the Suttenstein. The return was rather easy, whereever possible I stepped into my tracks from the way up. At the Suttenstein I rested and enjoyed the views into the Suttental (Suttenvalley). From the southwest I could already see the annouced bad weather coming and the wind took up a notch or two . The way down through the snow of the Nordhang (north hill) to the Unterer Firstalm went remarkably quicker and easier than the way up, so that it took me only about 15 minutes to reach the Untere Firstalm. Lots of hikers and walkers came uphill while I was on the road down to the parking lot. 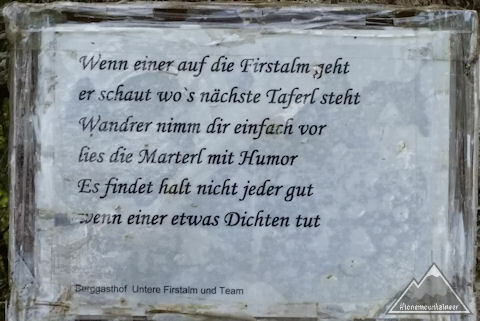 Probably they all “just” wanted to go the Firstalmen circular walk. 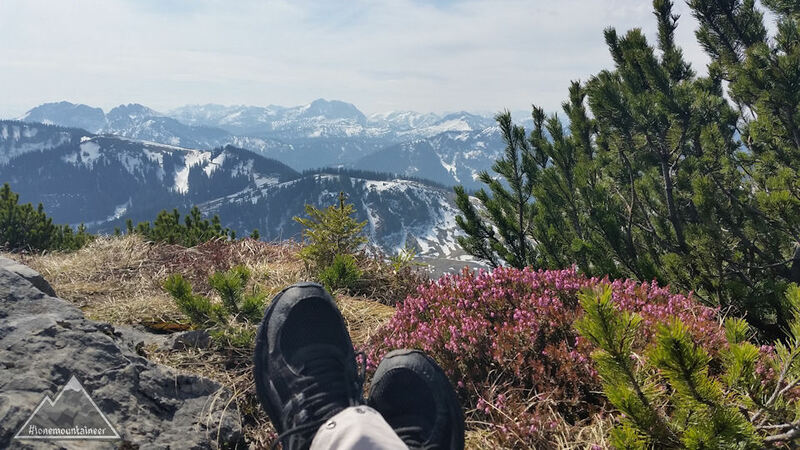 Even though I didn’t make it up to the summit of the Bodenschneid, so it was very nice for me and totally worth it. And next time (for sure this year) I will be able to end the tour as planned. Last year, when I started to enjoy montaineering I found only time for five tours late in the year. Now, for this years my plans are more ambitious: 20 Tours to summit shall it be. That means I have to start early! A rather short tour for the start of the season. To keep the unavoidable sore muscles to a minimum. According to bergtour-online.de it’s a tour of about 3 1/2 hours: 2 hours up to the peak and 1 1/2 hours for the return. I left early in the morning so that could start off at 9 am from the parking lot at the Spitzingsaddle. The 4€ parking fee were immediately cashed in by the friendly parkguide after he directed me where and how to park. So it proved unnecessary that I gathered extra change to feed the parking meter. The track starts right across the road from the parking lot. 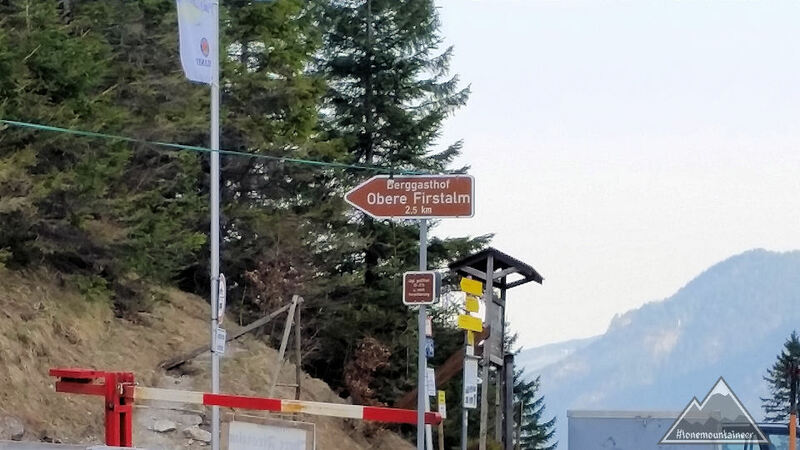 You cant miss the big sign “Berggasthof Obere Firstalm 2,5 km”. The forest road, which serves in winter as a sled track, leads without big turns but for a forest road remarkably steep uphill. 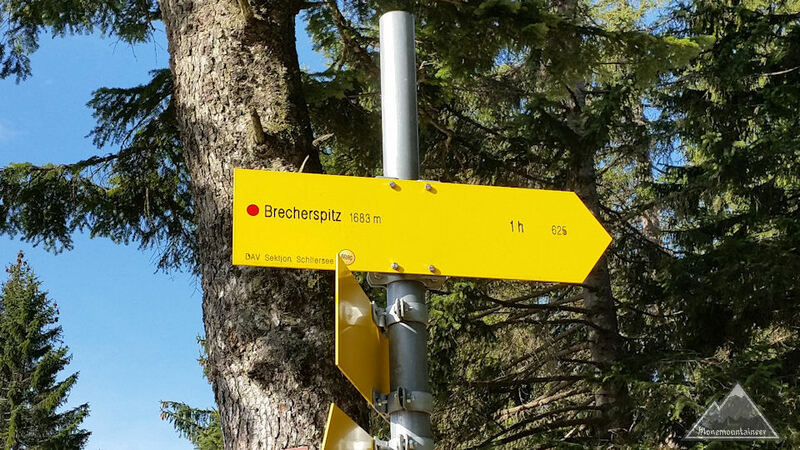 When it starts to flatten out and even going slightly downhill, you get to the “junction” to “Brecherspitz 1 h”. 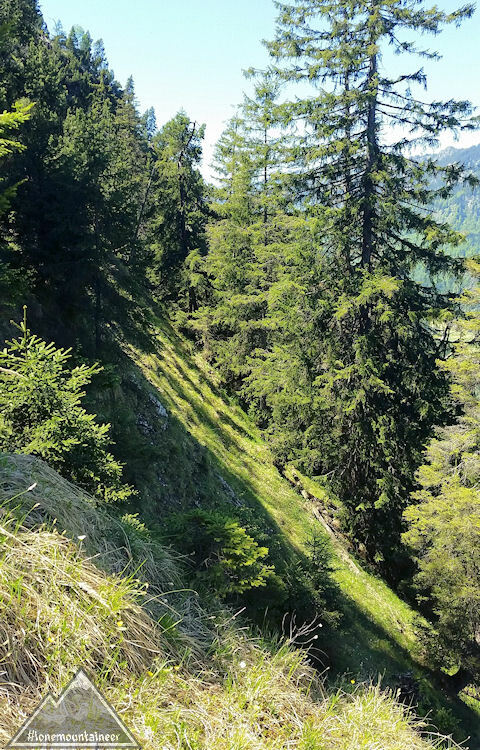 A few steps after the turn you can see the pretty long, steep hillside up to the Brecherspitz pre-summit. A couple of times signs point out, to stay on the path and not abbreviate, to spare the nature. After about half an hour you get to the pre-summit. 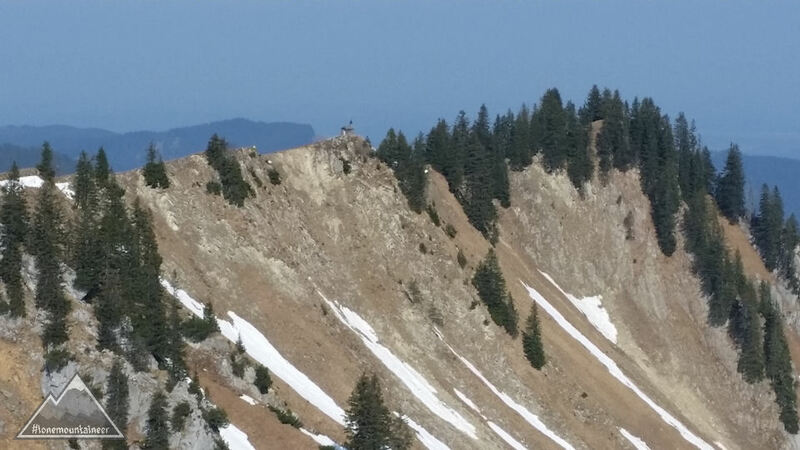 A little bit to the left, off the path, you get a first good view onto the Brecherspitz and the ridge over which you get there. From here you have to follow the ridge. It’s mandatory to be sure footed and free from giddyness, but the attached steel ropes make it easy. 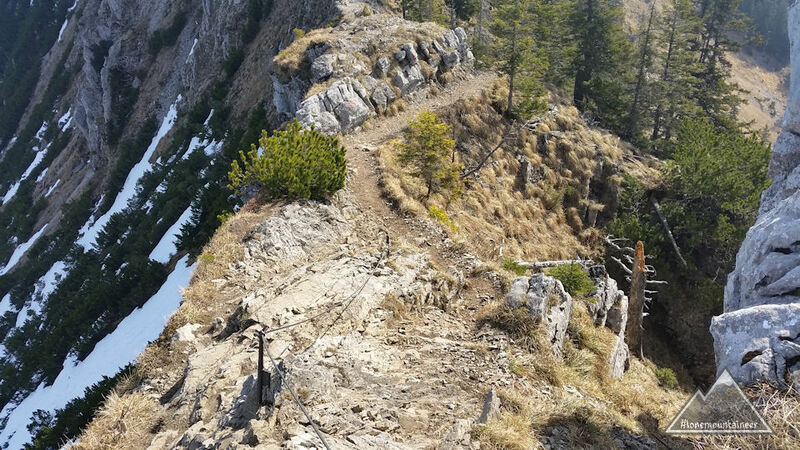 At first the path leads steep down, which already comes close to climbing. Then it leads straight up to the summit. 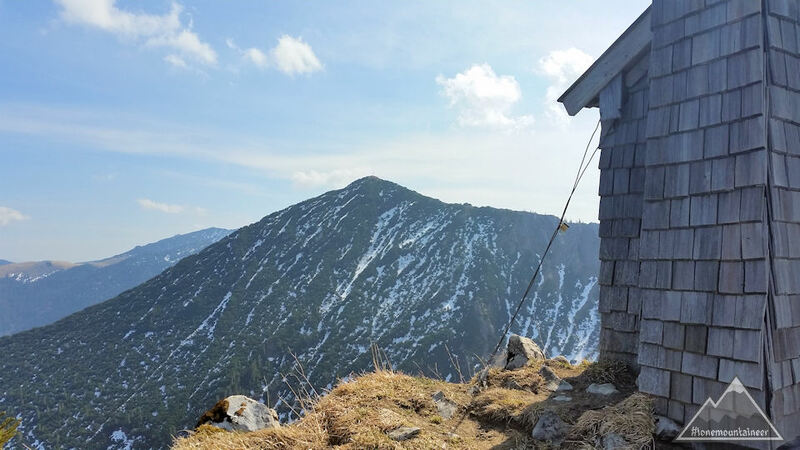 From the ridge you get a first view at the Spitzingsee and looking back at the Freudenreich chapel. From the well-visited peak (you can probably only rarely experience solitude here) you have a fantastic panoramic view. After vespers and enjoying the view and the sunshine, you return along the ridge back to the pre-summit. The return took longer than expected as the oncoming traffic increased in the meantime. and you don’t want to squeeze by exactly at the steepest and tightest spots. The sign “Freudenreich-Kapelle 30 min” (Freudenreich Chapel) tempts me to make a detour. The path proves to be more difficult than expected – at least that early in the year. At a few spots there is plenty of snow on the path, which makes especially going downhill pretty slippery. But also the uphill passages are not without complications. At one spot they even put in two iron clamps to make it easier to pass. The Freudenreich chapel ist even smaller than expected from the distance. From here you have a good free view at the Brecherspitz, again. From here a steep path leads downhill over an open hillside. 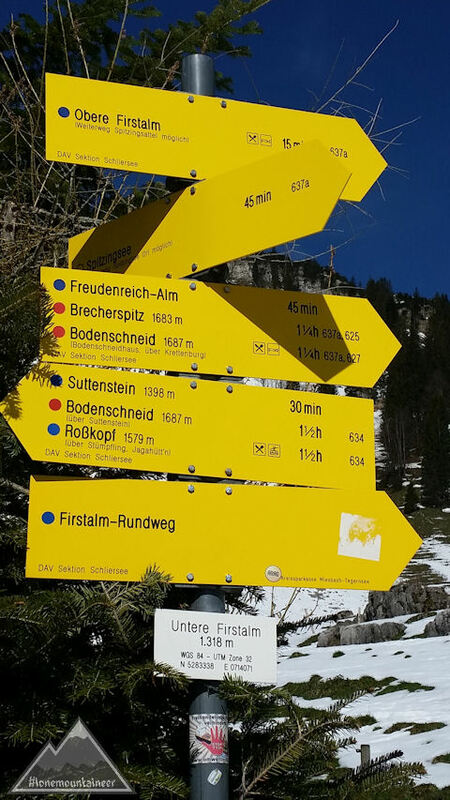 A sign “Freudenreich-Alm 1 hour” let’s me think about a going down here. And then return to the Obere Firstalm farther down. But I couldn’t find any sign, that there would be a track leading back to the Obere Firstalm from here. So I decided to return via the pre-summit . 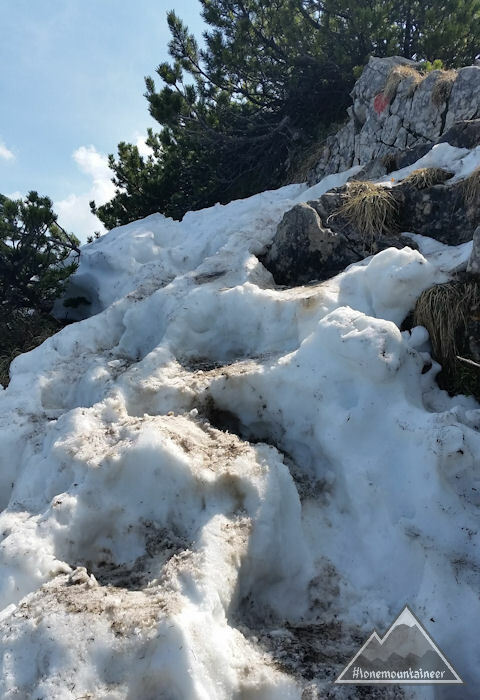 On the return – the snowfields are uphill much less a problem than they were going down – a short break at the pre-summit. Before I take the descent over the steep path back to the Obere Firstalm. Arriving at the forest road, one last detour to inspect the Obere Firstalm. 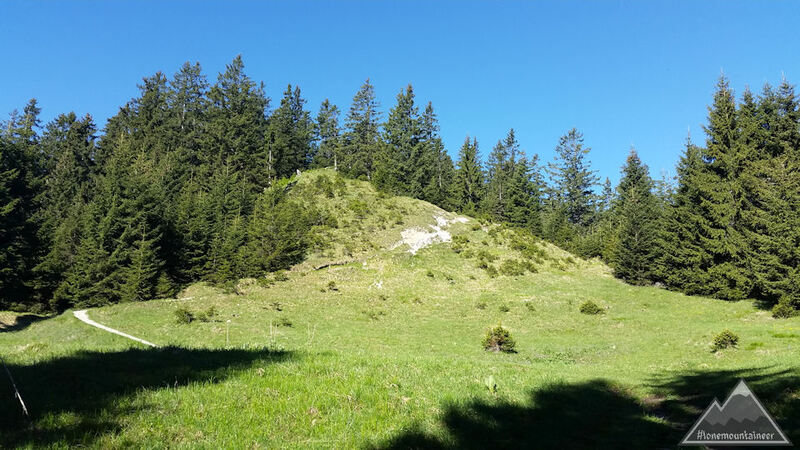 Here I discover a sign: “Freudenreich-Alm 30 min”. Would have been possible. Well, next time. 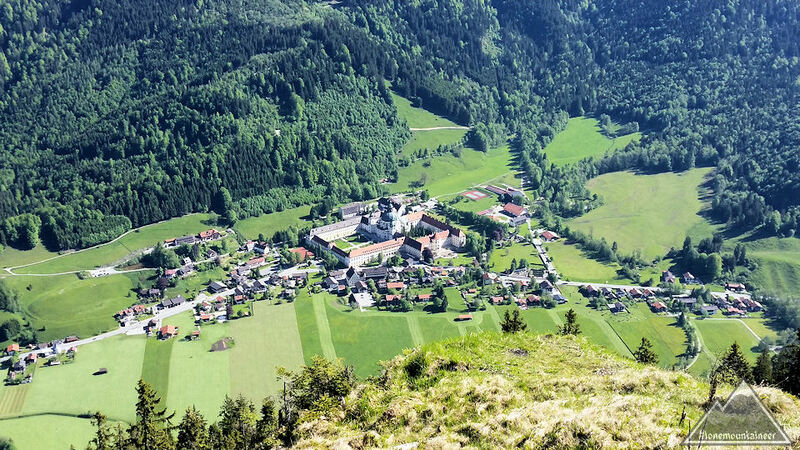 But then I would go from the Obere Firstalm to the Freudenreich-Alm. And then from there up via the Freudenreich-Chapel to the pre-summit. Then further to the Brecherspitz summit. Taking the direct route to the Obere Firstalm on the return. That way you would have at least part of the tour a round-tour and you wouldn’t have to go back and forth the same way. The return over the forest road down to the parking lot is pretty unspectacular. 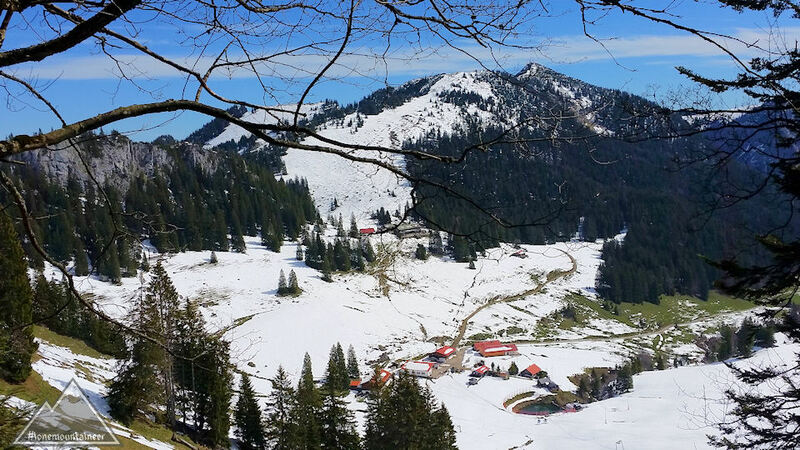 All in all – also thank to the fantastic weather – a wonderful start into the season. 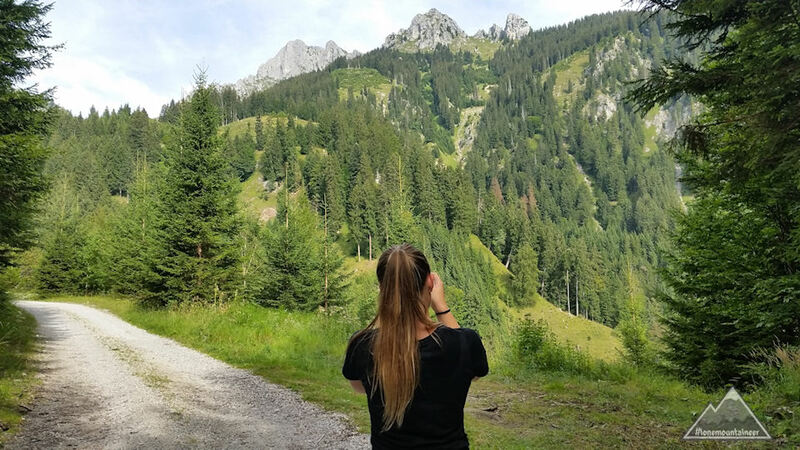 August/September 2014 I spent my vacacation with my family in Reutte/Tyrol. Unfortunately it was raining almost all the time. The first day the weather was still nice. So we took the opportunity and got up onto the Hahnenkamm with the Hahnenkammbahn. 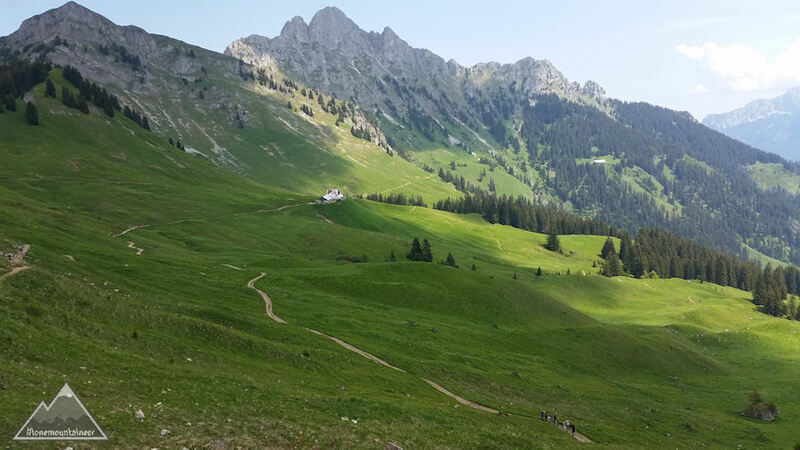 There we hiked via the peak of the Hahnenkamm all the way to the Lechaschauer Alm. On the return we followed the Alpenrosenweg via Singer hut. And from there back to the Panoramarestaurant Hahnenkamm next to the top station. 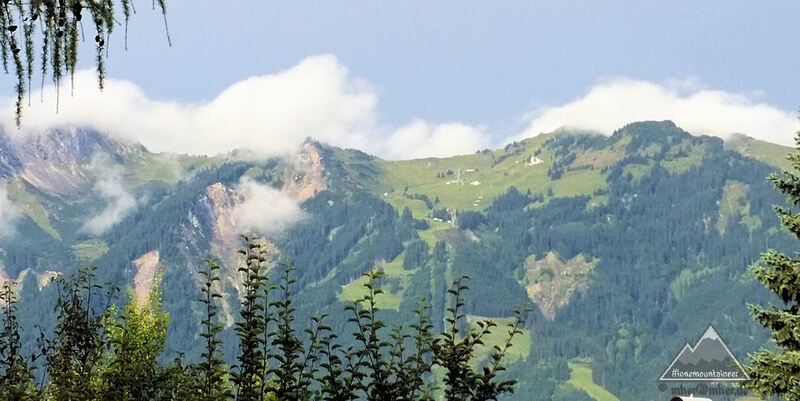 From our appartement we had once and again – whenever the weather allowed – a direct view of the Hahnenkamm and it’s meadows belows. The rose an ever growing urge in me to walk up there once. “The mountain is calling!” 🙂 But unfortunately the weather remained rainy and didn’t allow this for the rest of the vacation. And the urge hasn’t gotten that strong yet, that I would’ve hiked up there in pouring rain. But somehow the challenge didn’t let go of me anymore. 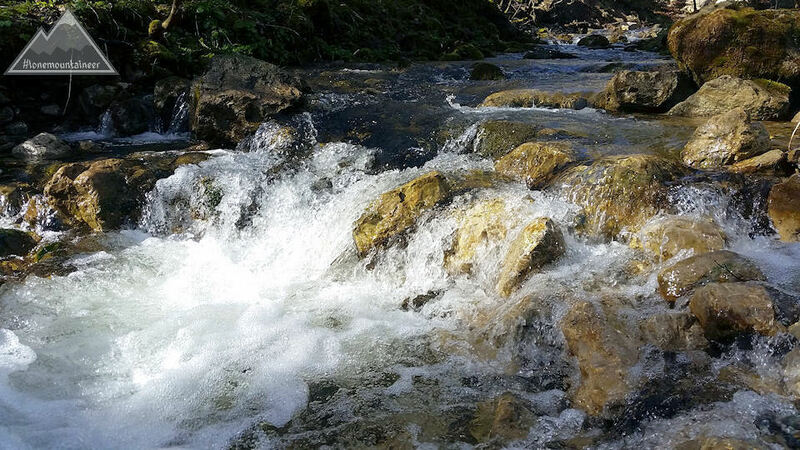 So finally at a free weekend in early June 2015 I spontaneously packed my hiking boots and backpack. 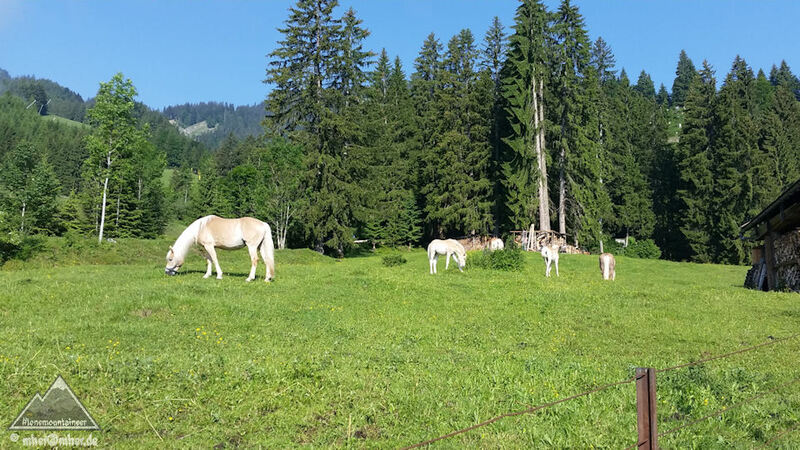 Drove very early in the morning to Reutte or more precise Höfen. 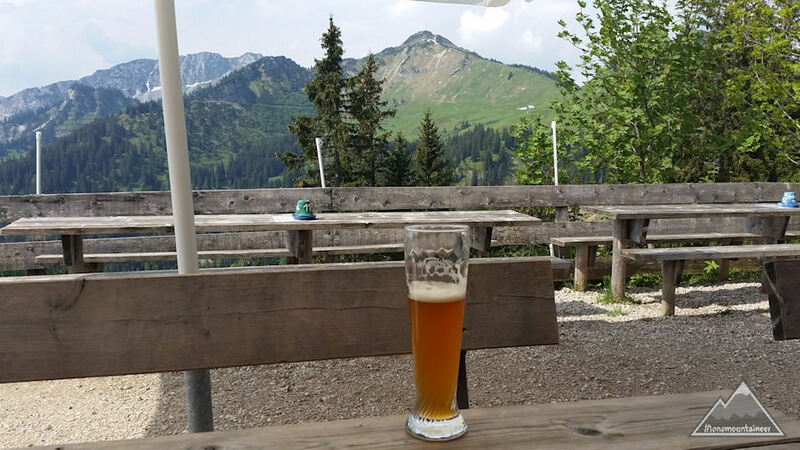 I parked my car at the big parking area above the valley station of the Hahnenkammbahn. 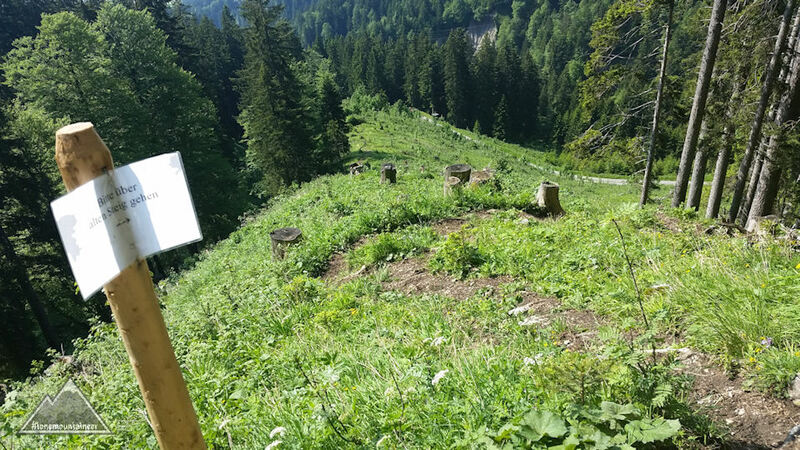 Then I followed the signs in the direction to Gehrenalpe. At first the track leads still down in the valley in direction Wängle and past the location Holz. first it crosses a meadow. Then it leads behind the Panoramahotel Talhof and across the Leinbach. 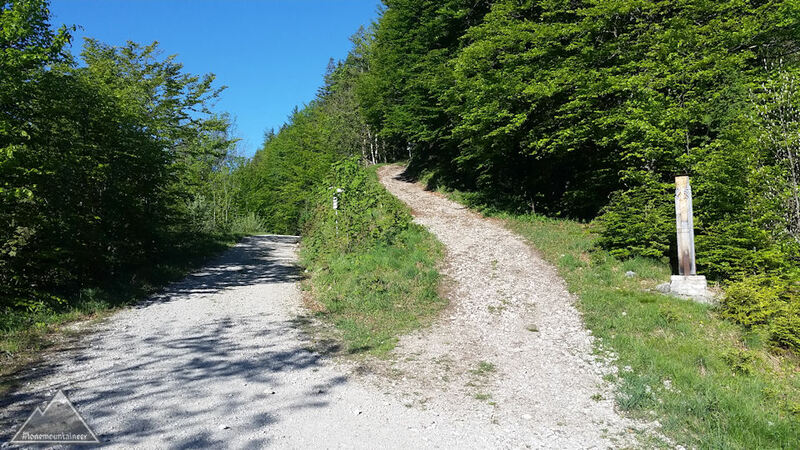 But there don’t turn left, but right, and after a few steps left again still in direction Wängle. Then following the rural lane above Winkl to a T-crossing, where it leads now up into the mountain. The steep track leads rather steep through the forest uphill. Once in a while it crosses the forest road. You can follow this, too. I.e. to go part of the way on a longer but far less steep track. And from this you will have great views at the surrounding mountains as well. After about an hour of hiking you have to follow the forest road for good. But only for a short distance. Then it leads up into the next steep track. 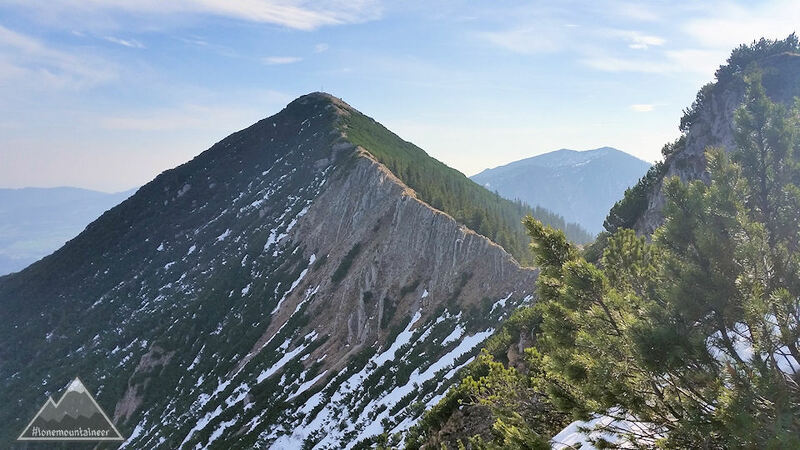 When I hiked there in 2015 it was recommended, due to a small mudslide, to take the “old steep track” (“alter Steig”) 100 m further up the forest road. But it must have been closer to 300-400 m (as I realized shortly after) so I didn’t find it. I decided to take that not-recommended track anyway. In the end it wasn’t a big problem, only when crossing the small, in the meantime pretty stable slide, I had to find my own way. Shortly after I came past the upper end of the “old steep path”. From there I could judge that I turned around too soon to find the bottom end. From here the path leads again very steep up through the forest. After around two hours from the start you arrive – almost surprisingly – at the Gehrenalpe. Here it’s great to have a nice, second mountaineer breakfast. And at the same time enjoy the wonderful view from the terrace. 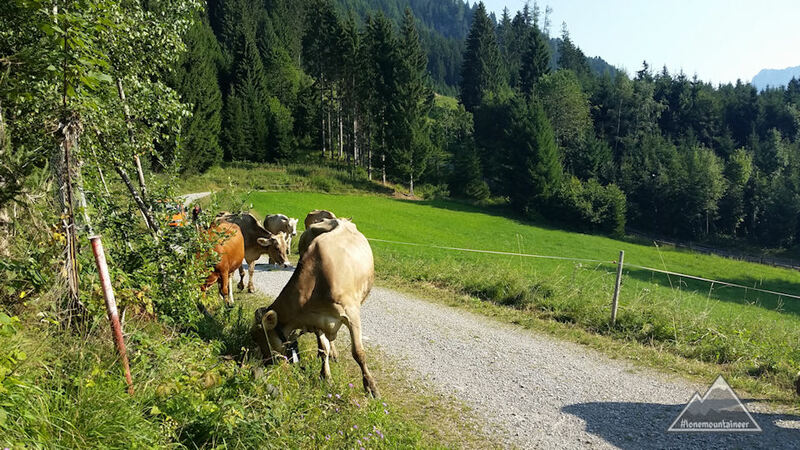 After a good rest you follow the hiking path across the mountain meadows over to the Lechaschauer Alm. From there father across the mountain saddle to the Singer hut. There are two alternative routes you can take. One is taking the Alpenrosenweg around the mountain to the Cilly hut. 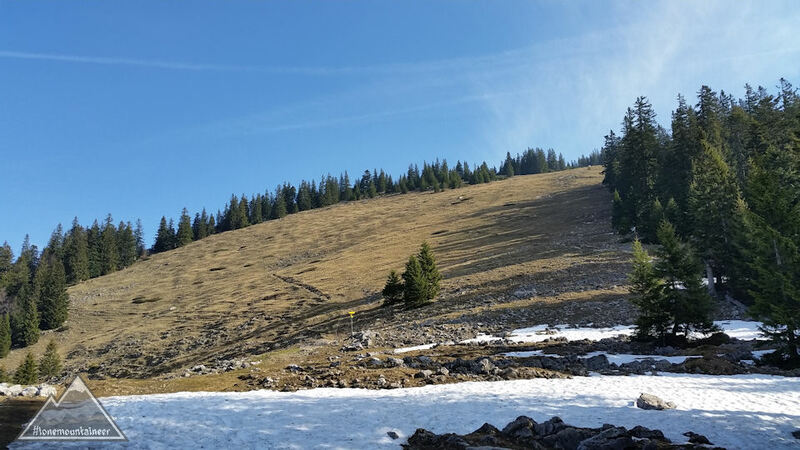 The other is going all the way up to the peak of the Hahnenkamm which then also leads to the Singer hut. But I choose to take the track over the saddle at the Alpenblumengarten (alpine flower garden) an arrived about one hour after I left the Gehrenalpe at the Singer hut.